Most cooks have tried a recipe that did not turn out how they planned. Sometimes it’s a cake that collapses on the counter, other times it’s a roast that ended up raw in the middle. The best thing to do when this happens is to try to learn from the mistake, so it does not happen again. We have rounded up a few common mistakes people make with slow cookers to try to help you avoid them in your kitchen. Be sure your slow cooker is working properly. It is critical that your slow cooker get to the right temperature to avoid problems with food safety. If you’re like me, you may have your grandmother’s old slow cooker. The good news is – you can test it. Just fill your slow cooker halfway with water and turn it on. It needs to heat to at least 170 degrees within two hours. You can test it with a food thermometer. If after two hours, the water is cooler than 170 degrees, your slow cooker is likely not heating your food fast enough and should not be used. Prep ahead the smart way. It is helpful to prep ingredients ahead so you can drop them into your slow cooker in the morning. However, do not mix raw meat and other ingredients together in advance. The safest approach is to keep meat separate from other ingredients until you are ready to cook. Cook foods to their usual safe temperatures. This helpful guide shows safe temperatures for meat, poultry, casseroles and more. You can measure temperatures using a food thermometer. Once foods reach a safe temperature, you can hold them in the slow cooker at or above 140 degrees. 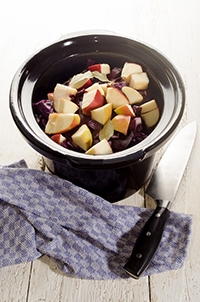 Follow these simple tips to make safe and tasty meals in your slow cooker. Happy slow cooking from the Spend Smart. Eat Smart. Team! I love using my slow cooker for many reasons. Right now, the main reason I love my slow cooker is the timing. There are usually two or three nights each week when someone in our family needs to be somewhere by 6 or 6:30. It is really hard for me to make a meal, feed everyone, and then get three children out the door on time. These are the nights when I rely on my slow cooker. I can do the prep for a meal the night before, load the slow cooker in the morning, and then have a great meal ready in the evening. Choose recipes that simmer on the stove top or roast in the oven. Reduce the amount of liquid in the recipe by 1/3 to 1/2. You need to do this because the slow cooker creates its own liquid. Adjust the cooking time. This website has a convenient conversion chart. If you have questions or concerns about your slow cooker, contact AnswerLine. They are a great resource for your home and family questions. Good luck converting some of your favorites into slow cooker recipes! We love our slow cookers at Spend Smart. Eat Smart. It is such a delight to come home from a busy day to a home-cooked meal that is ready to eat. At our holiday potluck, three of us made slow cooker dishes! Chicken and Broth: This simple dish will leave you with delicious homemade chicken broth as well as cooked chicken to use in other dishes. Slow Cooker Black Eyed Pea Soup: It’s our recipe of the month and it’s perfect for this time of year. It is a tasty option for a meatless meal. Slow Cooker Pork Chili: This rich, flavorful chili will warm you up on the chilliest winter day. Best of all, the leftover pork from this recipe can be transformed into Shredded Pork Sandwiches. Nothing beats cooking once and eating twice! I hope you give these recipes a try this winter. Next week Justine will share how you can get creative by converting recipes to work in a slow cooker. We often get request for recipes that can be made in a slow cooker. It’s not surprising since you can add the ingredients to the slow cooker, turn it on, and then go about your day while the food cooks. No need to spend a lot of time in the kitchen when you have other things you need to do! Here are some tips to keep food safe when using a slow cooker. Cook foods using the low or high heat setting. If possible, turn the cooker on the highest setting for the first hour of cooking time and then to low or the setting called for in your recipe. However, it’s safe to cook foods on low the entire time. Do not use the warm setting to cook food. It is designed to keep cooked food hot. Always thaw meat or poultry before putting it into a slow cooker. If frozen pieces are used, they will not reach 140°F quick enough and could possibly result in a foodborne illness. If possible, cut the meat into small chunks. The temperature danger zone is between 40°F and 140°. If food is in this temperature zone for more than 2 hours, harmful bacteria may grow to unsafe levels. Place vegetables on the bottom and near the sides of the slow cooker. Vegetables cook the slowest, so you want them near the heat. Keep the lid in place. Each time the lid is raised, the internal temperature drops 10 to 15 degrees and the cooking process is slowed by 30 minutes. Place leftovers in shallow containers and refrigerate. Do not leave cooked food to cool down in the slow cooker. Reheat food on the stove top or microwave and transfer to a slow cooker to keep warm (140°F or above). Do not reheat food or leftovers in a slow cooker. Last night I had my siblings, their spouses, and my parents for supper (11 in all). It was one of those times that I invited everyone and then started thinking about what I could make. The menu was a little trickier since my oven stopped working last week and I don’t have a replacement. I didn’t want to spend all day preparing the meal or spend lots of money—plus I wasn’t sure what time we would actually sit down to eat. The only foods I purchased were the meat, carrots, apples, and Italian bread. Using those costs, plus estimating what I used on hand, the meal total was around $16 (not including the squash harvested from the garden). Pork steak was $1.59/pound while beef stew meat was $3.29/pound. I bought 3 pounds of the bone-in pork steak. It took 20 minutes to cut it into bite size chunks. It took another 20 minutes to peel and cut up the potatoes, carrots, and onions. (I used about 2.5 pounds potatoes, 1 pound onion, and 1.5 pounds carrots.) The recipe I found on allrecipes.com used bay leaf, Worcestershire sauce, beef broth, salt, pepper, and wine. I choose this recipe since it did not use a seasoning mix. I also added a can of diced tomatoes. I had two large butternut squash left from the garden which needed to be used, so I cooked them in the microwave and mashed them with a little brown sugar and margarine. The apples I sliced right before we were ready to eat, so they wouldn’t brown. For an appetizer, I had a package of a knock-off chex mix. Since this didn’t look like enough for everyone, I made several batches of popcorn. Interestingly enough, the chex mix was left and the popcorn was eaten. Next time I’ll just do popcorn, which is super cheap when you pop it on top of the stove. Plan menus around what you have on hand. Cut the meat yourself—you frequently pay a premium for the butcher to cut it for you. Soups and stews stretch your meat dollar because you can add more vegetables and use less meat. You can skip the cost of seasoning packets when you use a recipe with the spices included. Simple foods like apples, popcorn, squash are inexpensive and healthy. Eat breakfast. This is the most important meal of the day and the most common one to skip. It’s also typically the fastest and the cheapest to make. Think oatmeal, toast, eggs, pancakes, fruit, low-fat milk. Just eating breakfast helps charge your brain and body. Buy staples. Beans, pasta, and oats are really inexpensive and filling. Canned fish or frozen vegetables don’t go bad before you can use them. Eggs are a very inexpensive protein as are beans and peanut butter. Plan ahead. When you are hungry and rushed, it is hard to think of budget foods. Make a slow-cooker recipe that will last several meals. Divide the food into several containers to make it easier to reheat. Or, keep the ingredients for an inexpensive meal on a shelf so you don’t have to think what to make when you are tired. A nutritious meal includes something from each food group: grain, meat, fruit, vegetable, and milk. Watch what you drink. Coffee, soda, energy drinks, and alcohol can be dehydrating and costly. Water and milk are healthy and inexpensive. Refillable water bottles pay for themselves within days.